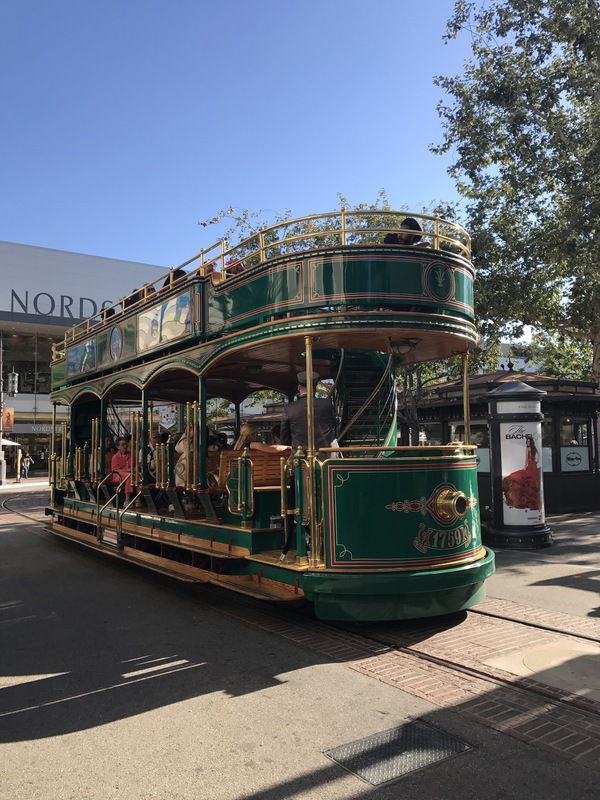 After a little shopping expedition at The Grove we started wandering aimlessly up Fairfax, no real idea what was coming other than Al looking at the different colours on the google map. First stop was Plan Check where we discovered an excellent happy hour. House wine & beer for $5 until 7pm. Winner! It’s a nice looking bar – good lighting, wood panels and high tables- and the wine is cold, can’t ask for much more. I was looking at the food people were ordering and it looks worth waiting here. It’s a fairly typical LA bar menu i.e. Tasty as hell. Plus they stick a few food items on the happy hour, I love this concept. Later on my food buddy Jax sent me a list of places for Santa Monica to try and I was pretty chuffed to see the Santa Monica site for Plan Check was on the list. Excellent find for our first stop! ** quick update: I went back, tested some snacks purely for research purposes. 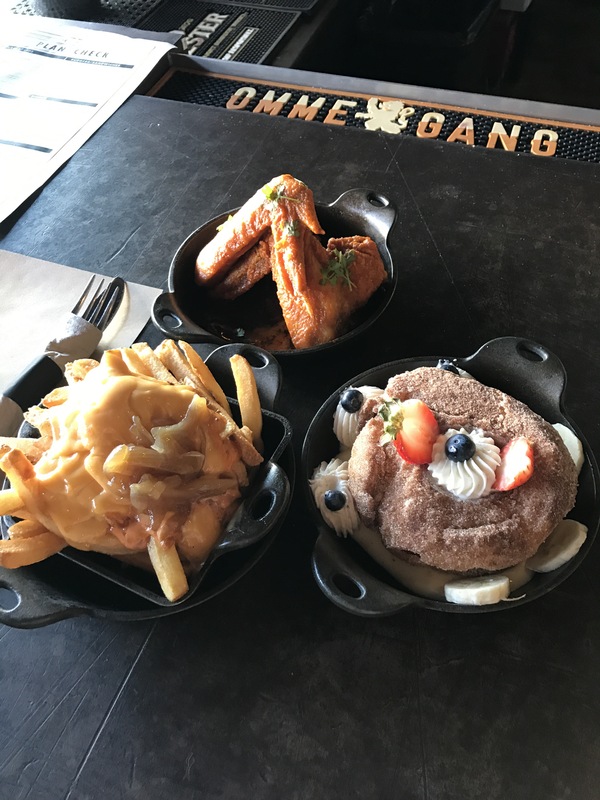 Off the happy hour we had the chicken wings, fries and donut. The wings are giant! About double the size of normal, and Al was pretty happy with the taste. The fries were the beast fries which were just amazing. Great actual fries covered in cheese, caramelised onions and some other secret yumminess. The donut is fresh cooked to order and is like giant, really good carnival donut. Obviously, more research is required in this menu and I will report back accordingly. A right turn onto Melrose and I found the cutest wine bar, Vinoteque! I love this place. 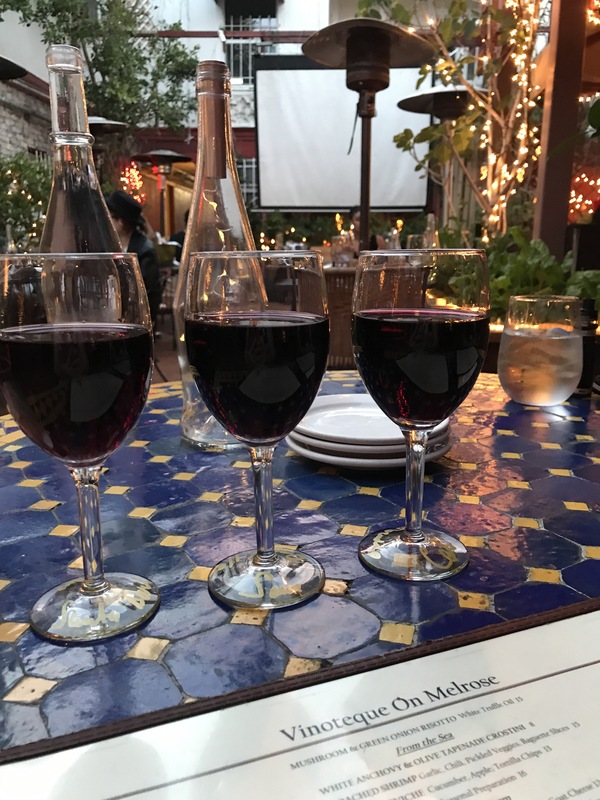 There is a great little courtyard which has you tucked off the street and the wine list is good! They will do any of their wines by the glass or bottle which is brilliant, but better than that are their wine flights. You simply tell the server your taste and they create you a flight which ends up being about $5 a glass. Brilliant value and you can test a few before deciding what to get by the bottle. 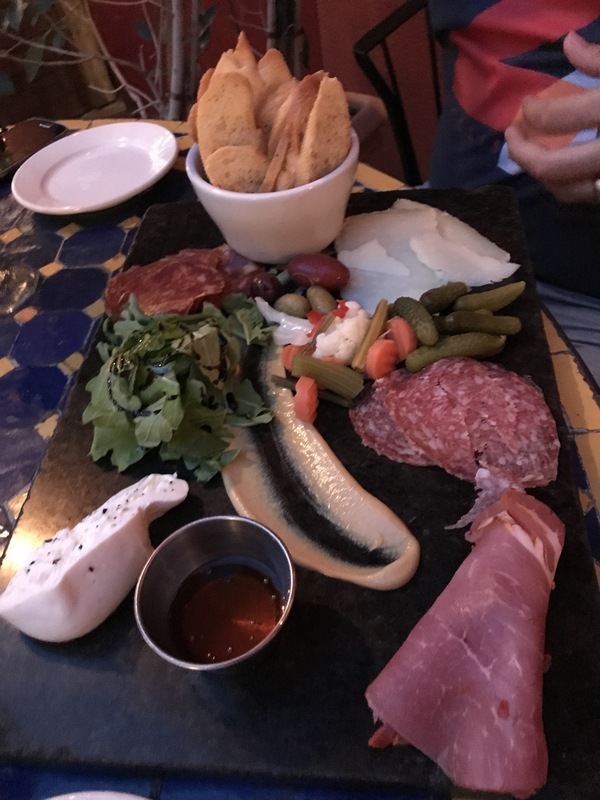 Add a charcuterie and cheese plate (there is more on their menu but these are my perfect wine accompaniments) and you pretty much have my idea of heaven. Next stop, The Darkroom a good old fashioned LA bar. All your typical – an extensive drinks list, booths, darts, pizza, burgers. Unsurprisingly, it’s pretty dark in here, but not in a creepy way. This is the sort of place you can stop for a quick drink or settle in for a few. The only logical thing left to do after a mini bar crawl- Pink’s Hotdogs. 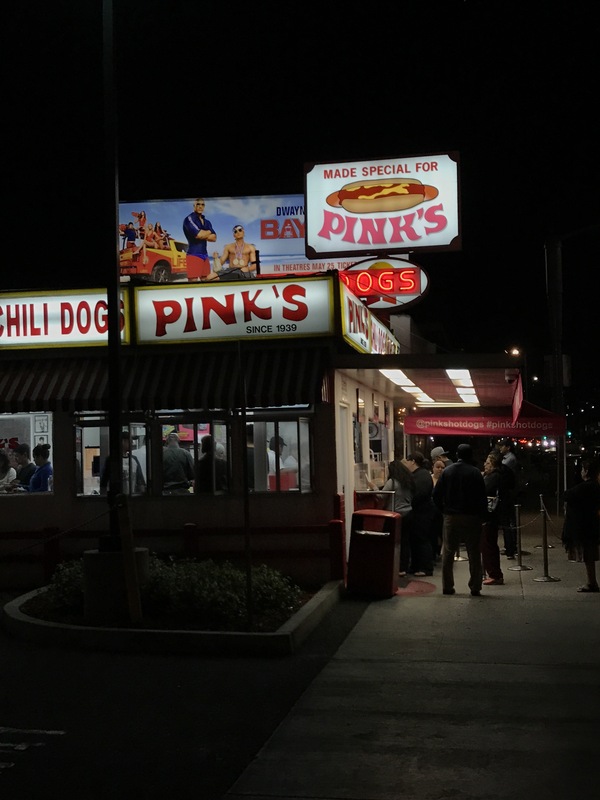 Pink’s is another LA icon, you don’t want to miss it. There will always be a queue, but it moves fast and it is worth the wait- there’s a reason they’ve been around for 77 years. 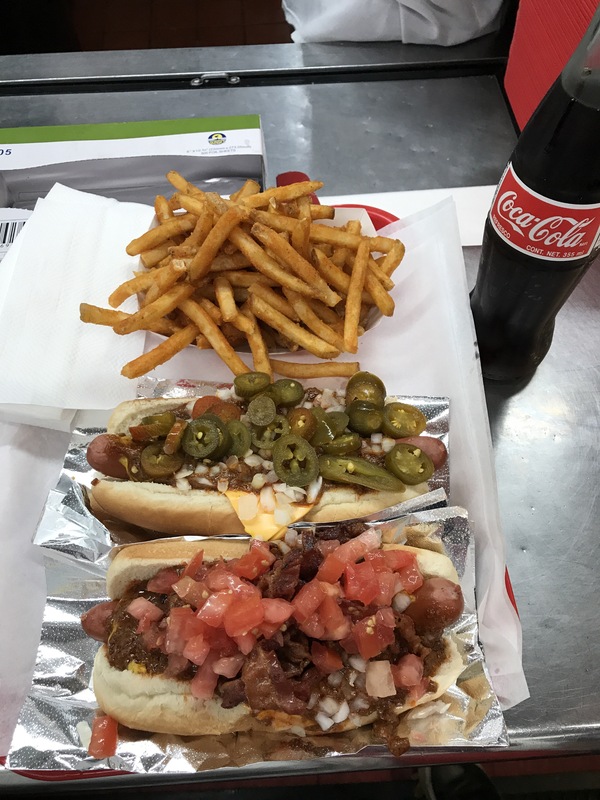 These are arguably the best dogs in LA, though I probably need to do some more research before making such a sweeping statement 😜 I went for a classic chilli cheese dog with added jalapeños. Yum, and that was not just the wine talking. There are so many different options to choose from, and it’s now down the road from me so I will be off taste testing more soon.